Shorter scan times and the desire for higher resolution were the driving forces behind the development of spiral scanning in 1990 and the first multi-detector row computed tomography (CT) systems in 1998. With the introduction of ECG-gated scanning on four-slice CT scanners in 1999, the first step toward cardiac imaging with multi-detector row computed tomography (MDCT) had been made. 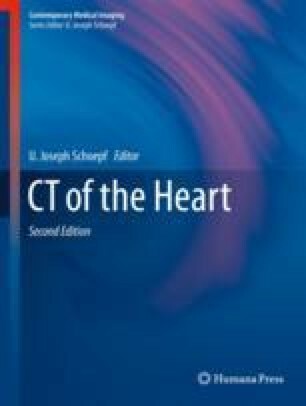 Available since 2004, 64-slice CT systems are currently considered prerequisite for routine cardiac imaging in clinical scenarios, and with its introduction, the task of imaging coronary arteries and calcium scoring replaced EBCT (electron beam CT) completely. 64-slice CT systems allowed for comprehensive diagnosis of morphology and cardiac function within one integrated CT examination, including high-resolution imaging of the coronary arteries. Improved temporal resolution (< 200 ms) was enabled by faster gantry rotation times down to 0.33 s and leading to an increased clinical robustness of ECG-gated scanning techniques at higher heart rates (Leber et al. J Am Coll Cardiol 46:147–154, 2005; Raff et al. J Am Coll Cardiol 46:552, 2005). ECG-gated 64-slice CT also started being used for rapid triage of patients with acute chest pain in the emergency room and for diagnosis of pulmonary embolism, aortic dissection or aneurysm, or significant coronary artery disease in one scan.